It appears that Andrew Paul Conly got lost in the woods in Northern Manitoba sometime around Aug. 4 and now has been found. He’s a little dehydrated, they say, but in otherwise good health. A hearty ‘cheers!’ to the RCMP for their great work in finding him. Is he known to police by any chance? 🙂 That doesn’t look like the kind of photo a family member would have sitting in a picture frame at home, unless they have a curious sense of humour to say the least. 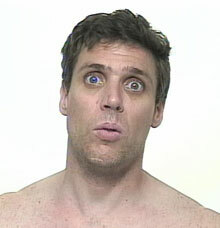 I’ve seen a lot of ugly and crazy mugshots, but I’ve never seen a shirtless one, and even a wife beater ‘strap’ would likely have been visible if it were a real mug shot. What the hell else is it then? That expression + being shirtless = ??? ?